Cosplay is about more than just putting on the clothes worn by a specific character. The act of assuming a new identity is liberating and empowering, and even if there’s nothing more to the performance than the costume, that costume can be all that’s needed to project that identity to the rest of the world. 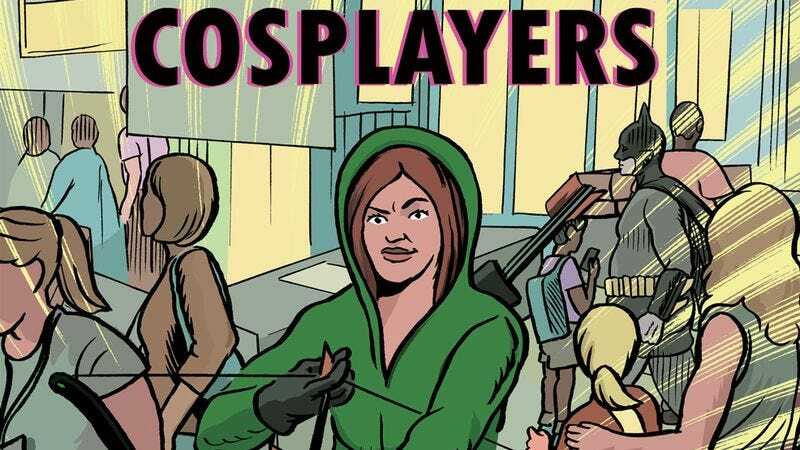 Dash Shaw’s Cosplayers (Fantagraphics) is fixated on the idea of performance and how it plays into personal interactions and artistic interpretations of real and imaginary concepts. The book collects the pamphlet-style comics published in 2014 following Annie and Verti, two cosplayers who create short films by cosplaying (wearing disguises) and filming short scenes with people who don’t know they’re on camera. Annie gets a thrill out of the manipulative power that she gains from this real-life cosplay, but Verti has more difficulty separating the performance from her true emotions, especially when she develops personal feelings for one of their marks. Performance in artistic interpretation is largely explored through cosplay in this title, but Shaw also takes a deep look at how performance plays out in comics, namely in the chapter set at Tezukacon, a convention dedicated to the works of manga pioneer Osamu Tezuka. A manga scholar explains that Tezuka looked at his characters as performers, and he would use the same character models for different roles the way a director uses the same actors. Tezuka’s focus on fully realizing these character performances contributed to his decompressed storytelling style, which has had a huge impact on the entire comic-book medium, including Shaw’s work. Cosplay is the jumping off point for Shaw to explore larger fandoms, and given the medium he’s working in, it makes sense that comics would get the most attention. One of the stories has Annie and Verti meeting a comic shop owner who tells of the supernatural power of Jack Kirby’s 2001: A Space Odyssey, and while he may sound like a madman, fans of Kirby’s work understand the raw power he’s rambling about. Shaw pokes fun at these fandoms, but he’s ultimately reverent of what they add to people’s lives. In the book’s final story, Verti muses about how she loves the way cosplay is a reflection of the person playing the character, and she appreciates it when a cosplayer is “wrong” or “off-model” because that brings something different to the established figure. Verti would love the drawings of cosplayers that Shaw sprinkles throughout this book, and the awkwardness of these images is the primary source of their charm. As with any other medium, it can be hard not to compare comics to the stories that have come before. On the one hand, it can be frustrating to feel like it’s impossible to find a comic that’s truly unique and unfamiliar; on the other, it makes it easier to suggest new titles to people if there’s something similar they already love. Fans of East Of West and Pretty Deadly should absolutely take a look at Greg Pak’s Kingsway West. A Western both in setting and in sentiment, Kingsway West #1 (Dark Horse) spectacularly sets up an alternate past, one where China controls a large swath of the Pacific coastal United States, and Mexico most of the rest, both vying for control of red gold, a fictional natural resource. Pak is no stranger to rapid world-building or gruff, slightly unsympathetic protagonists, and he knocks it out of the park here. Kingsway Law is the perfect central character for a Western, epitomizing, as Pak puts it, “the story of a monster who tried to become a man again.” In just this first issue there are begrudging firefights that Law wins handily, the saving of innocent creatures, and encounters with brash women. Law even talks to himself and some of those same innocent creatures. It’s the best of what a Western can be, with the added twist of cultural and historical expectations that Law has to bear as a Chinese man rejecting the rule of a Chinese leader. Kingsway West hits the ground running and only speeds up thanks in no small part to the art team. Mirko Colak certainly isn’t a newcomer to comics, but he’s drawn mostly single issues and a few short runs, which is a bit of a surprise given how well he nails the crisp but filthy tone that suits Pak’s world. With the sweeping vistas, a diverse cast, and fantastical creatures, Colak flexes some impressive muscles, especially in his panel layouts. There are pages that are cinematic and individual panels that look like perfectly framed shots, making the book a joy to read, with little details popping out on each revisit. Veteran colorist Wil Quintana does an excellent job of making the art pop even more, and the overall effect is like True Grit or High Noon in comic book form. Collecting the eponymous self-published series, originally published between 1990 and 2015, Real Deal Comix (Fantagraphics) serves as the missing link between the alt-comix of the 1960s and ’70s and the trashy throwback aesthetics of Jonny Negron, Anya Davidson, and Ben Marra. Constructed with co-author Lawrence “Raw Dog” Hubbard’s expressive and vital lines, the stories featured in Real Deal Comix blend the lurid films of the Blaxploitation movement with over-the-top and hyperbolic violence of a Quentin Tarantino or Robert Rodriguez film. Hubbard’s aggressive, downright crude inks give the proceedings a cartoonish and intentionally ridiculous quality, and the dialogue reverberates with lines like “…my pops needs your help. He works for G.M. on the assembly line. He borrowed money from loan sharks. Now that he can’t pay them they want him to help them break into the union!! !” In supplemental backmatter, Stussy’s art director, Adam Jay Weissman, notes that Hubbard strove to render stylized faces with realistic bodies—to blend the expressive with the visceral. This visual dissonance works well here, and the nostalgic redoubling effectively brings the Blaxploitation ethos into the new millennium. That ethos, however, is deeply problematic. Looking to the Blaxploitation canon, we have women who are positioned as competent protagonists but also as hyper-sexual objects (literally) of desire. In characters like Trouble Man’s Mr. T, we have characters who are at odds with the law, but who nonetheless strive to better their community. The brief movement offered up a mass of filmic representation to black audiences, but its often-stereotypical characters inhabit the liminal space between good and bad, exhibiting the coded characteristics of both.